This column was originally published in the December 2014 issue of ABOUT the River Valley magazine. A few weeks ago, my family and I went walking in the country where we came across a partially dry creek bed. It was the same creek I once played in as a child, just a little further upstream from the banks I knew. Water congregated in shallow, leaf-filled puddles. We found a tiny frog, likely seeking out a spot for hibernation. Everything was still and quiet. But you could tell from the high banks that this creek had once been filled with rushing water. As we walked along I told my sons about how I used to write messages on scraps of paper and stuff them inside empty Sprite bottles, sending them down stream. I was probably around eight-years-old at the time, and had read somewhere that all streams lead to the ocean. I became obsessed with this realization that water is forever winding its way downstream. I wish I could remember what I wrote on those little scraps of paper, but I am pretty certain I always included my mailing address in hopes someday I’d receive a letter from another country. I know now that my messages in a bottle probably never made it out of Arkansas and likely only contributed to the piles of trash along creek beds in Yell County. But at the time, the creek seemed fundamentally connected to water systems of the world. Perhaps I overestimated the potential of that small branch to carry messages to the Arkansas River and beyond. But the core idea—that the creek was intrinsically connected to a global water system which sustains us all—stands the test of time. My sons were curious about the height of the rocky creek bed. In some places it was taller than even me, dark brown dirt woven with roots tangled in the curves of the soil. I imagined the fast rushing creek I once I heard as a child and how, during rainy months, I’d hear it moving long before my eyes ever caught sight of the sun bouncing off the water. I recalled the voice of my father telling me that when he was a child the creek ran all year long and had once provided enough water for the area cattle. Downstream there was even a dipping vat where farmers once dipped their animals in the current. By the time I was a child in 1980s the creek only ran part of the year. These days it doesn’t run much at all. 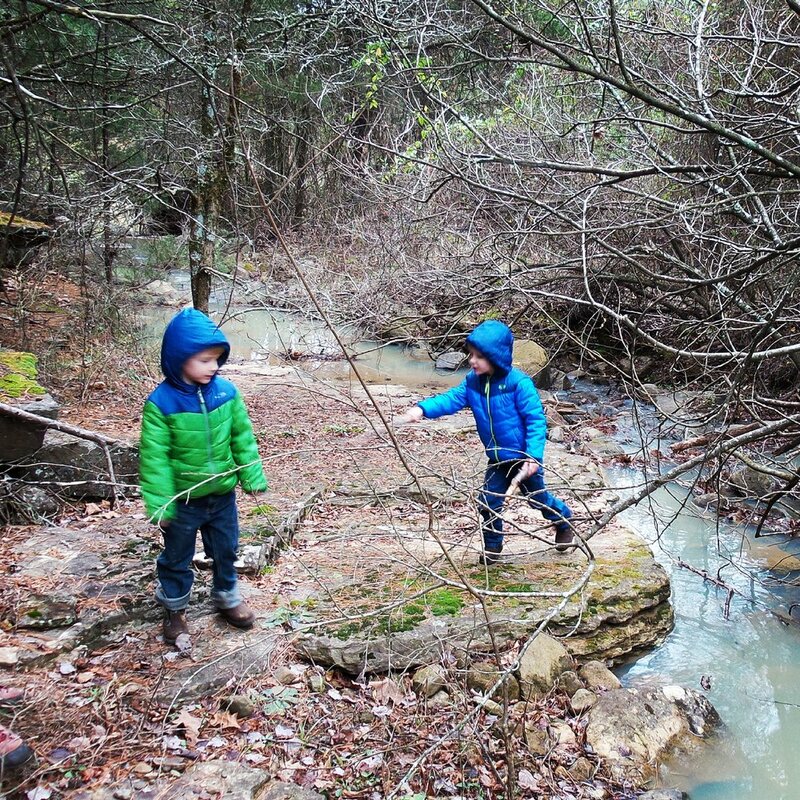 I looked over at my sons, bending over poking fallen limbs into leaves in the muddy puddles. I searched for a way to explain to them how and why a creek can dry up. I tried to find a way to tell them about the sacred nature of water. Mostly I just told them the stories I knew about my own childhood and my father’s childhood. Something shifted in me that afternoon as we walked around that mostly dry creek bed; a stirring feeling I will likely try to name for decades to come. My father probably didn’t realize it at the time, but those stories he told me about the history of the creek left a huge impression on me as a child. I didn’t know a thing about depleting water tables or aquifers or drought or how massive agricultural ventures and our own wastefulness as a nation is depleting our most precious natural resource. All I knew was that the water is always in motion and that the creek I loved to play in—the creek that I somehow knew was connected to all other creeks—used to run year round. I didn’t have a name for what I felt, but I could feel that story somewhere deep in my psyche. All children recognize the importance of a running stream. My dad’s stories set the stage for research I did years later while working as a reporter for KUAF 91.3 FM where I once produced the Saturday version of Ozarks at Large, a weekly news and cultural program based in Fayetteville. In the early 2000s, I interviewed city water officials about the regional drought and learned just how much water the average household wastes every day. It’s not just a matter of us taking long showers, always running the washing machine or dumping millions of gallons of water on spacious lawns that will never grow into food for animals or people. Even the way our water systems are set up encourages waste. For example, the water we use to flush our toilets goes through the same purification process as the water from the tap. There are people around the world desperately in need of clean water and we use a huge chunk of ours to flush the commode. Just think about that for a minute. In a country that values innovation and claims to relish the beauty of our natural landscape, is this really the best we can do? Can we begin to rethink our relationship to water? This past week I read about a project in San Francisco where a group of artists took images of the city and painted all the arroyos (streams that only run in the rainy season) that once ran through the heart of downtown. With all the development in the city, these streams have been rerouted or have dried up. I began to wonder what such a map might look like here in central Arkansas. Although still largely rural, we’re losing our waterways all the time. Aquifers lower. Creeks become seasonal. We spend millions of dollars using water fit to drink just to keep our front yards green. What if we used that water to grow food instead? It would take at least a tiny bit of pressure off the massive agricultural ventures that need more and more water to feed our growing populations. We keep laying down pavement for new roads, adding to storm water runoff that erodes the soil and sends toxins to the water sources. What if we implemented water retention gardens around our new parking lots and roads? It’s a simple investment that can cut down on erosion and even flash flooding.